He's off again, campaigning, hanging out, causing trouble. And as usual, making me do all the work. This being an election year - insert VOTE FOR LARRY plug here - Larry set up a Tumblr page so he - and you - can post relevant (or irrelevant) items about the election... or anything else that comes to mind. (consumerism, celebrity worship, sweat shops, the electoral college, the girl next door, Walden, etc, etc. etc.) It's a communal effort- Larry will add things as long as you do. I talked him into something else too. 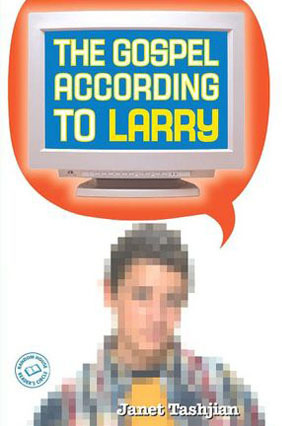 A SECRET Tumblr page where Larry and I will answer questions to those of you who've already read the book. (Don't you hate those SPOILER ALERTS?) So as not to give the book away, the password to the page comes from the text itself: What was Peter's girlfriend Katherine obsessed with? (no spaces, lower case) Post your questions; I promise we'll get to them. Ask away! I'm also putting up some info on the books with reviews and awards. There's lots of information in the TEACHER RESOURCES page too. One more thing, for those of you old enough - definitely the most important thing here: DON'T FORGET TO REGISTER TO VOTE!